The Eco Cave Garden is fast becoming a popular destination. Located in Sukhatal or Mallital as it is commonly known, on the Kaladungi road, it is a natural park maintained by the local administration. A network of inter-connected rocky caves and hanging gardens, it leads the visitor into a mysterious and ancient dream - world and gives the tourist an encapsulated glimpse of what the wilderness of the hill-region can offer-right in the easily approachable middle of civilization. Drive straight up to entrance, climb up a short flight of steps cut into the hill-side, and enter the cave - world of our prehistoric ancestors. 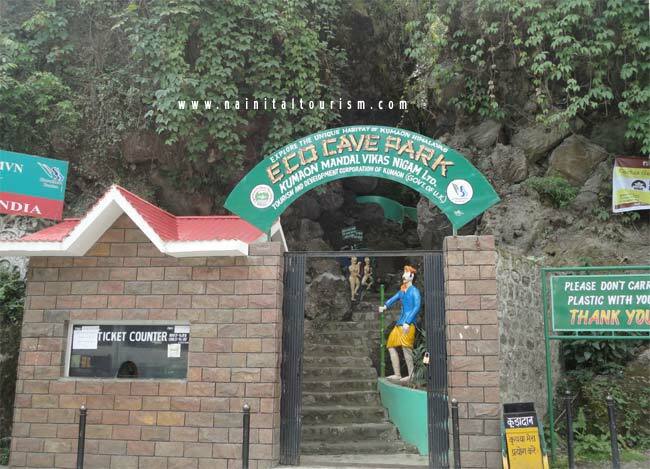 The Eco cave garden and musical fountain is about ONE kilometre away from the Mall Road Nainital and comprises of SIX small caves with the forms of tiger, panther, porcupine and so on. Walking down the Garden stretch, stumbling upon an underground cave that resembles wild forms and crawling ones way through them would definitely make for an exciting, fun-filled and informative trip for children and adults alike. The musical fountain, a first in Nainital, is a spectacle to watch as the evening descends. It operates through the months of May and June. It is great place for children with lots of activities and fun on offer. The Tiger Cave is the easiest to get in and out. Then the Panther Cave where getting in and out gets harder. These were natural caves and some of the then were really to narrow and going down below is really difficult. 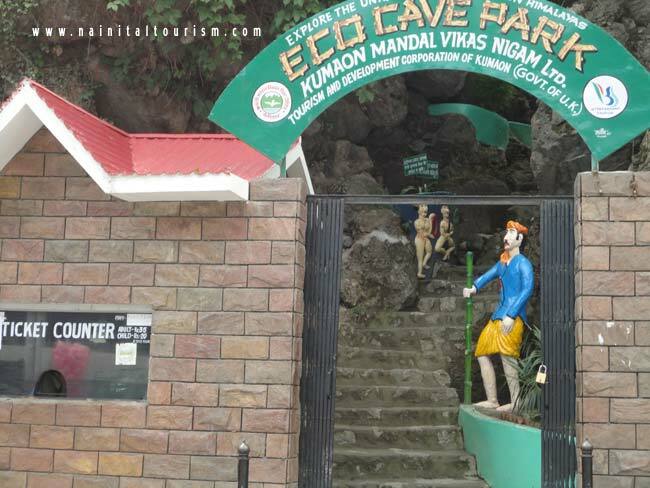 Eco Cave garden is a latest entrant into the many attractions of Nainital. You can make your visit to Nainital a memorable one with a trip to these gardens wherein you can introduce your child to an eco-friendly life. Children can make this an informative trip learning all about ecosphere and taking a peek into an adventurous life. The garden has six caves and a musical fountain operating during the best season. The gardens have an excellent approach to getting kids interested in nature and take a liking to exploring things. Later, when you emerge back into the world of today, you can relax in the hilltop - garden, surrounded on all sides by the lush green hills, from where you can have an un-interrupted view of four peaks that stands as sentinels over this beautiful resort town. Aesthetically designed to give you a glimpse of the hill-culture of this region. But the best is reserved for the evening, when the audio-visual treat of the musical-fountain, the first of its kind in Uttarakhand modeled after Disneyland in Florida U.S.A awaits you. You can Visit The Eco Cave Garden By Taxi, By Nainital Tours Package, Or On foot.